Buying and owning a piece of real estate within Reunion Resort is a fabulous and rewarding experience, and we are happy to share some great advice through our blog, to help home owners make the very best of their home purchase in this exclusive gated community! There’s no doubt about it, HomeAway is an invaluable partner for property managers and homeowners. Lots of bookings provide plenty of revenue to cover costs and generate additional reserves for a vacation rental home and we take a very detailed look at what you can do to maximize your home’s potential on this amazing booking channel. Fast responses to guest enquiries is without doubt one of the most important aspects of building a successful rental home listing on any website. When potential guests begin their search, they want to do a little research, ensure they are getting the right destination and accommodation, then move fast! Do all you can to make that process as easy as possible for them. Be the one homeowner that hits the reply button promptly and the reward will be more bookings! Turn on Instant Book to boost your place in search positions within HomeAway whenever possible. HomeAway will reward homes that book well on their site, with higher search positions. They want the most popular and profitable homes at the top of their lists. Presenting your home with the best chance of appeal, price, features and reviews will make that process a natural occurrence, leading of course to even more and more bookings! 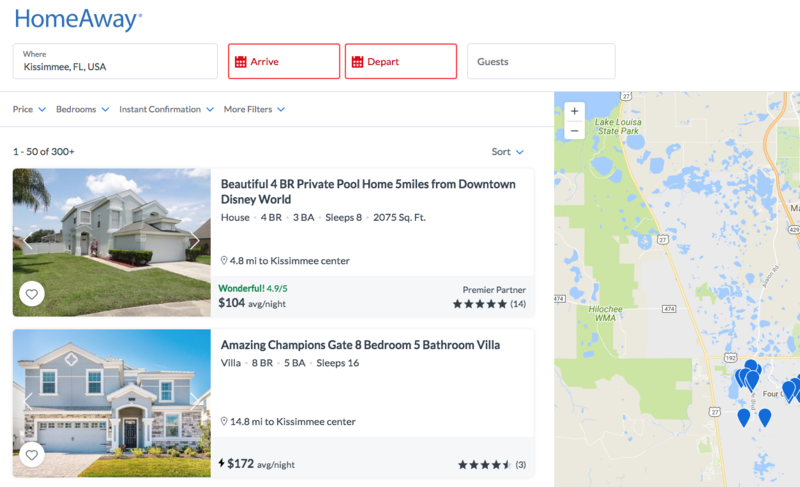 If you have poor images, highly priced nightly rates, the home will not book and just slips further down the heap of the thousands of homes near Walt Disney World. Get those reviews, every time a guest stays. Do all you can to encourage guests to leave a review and your listing will soar up the page. Keep in touch with guests throughout their stay and ensure they have a wonderful time. If things aren’t going perfectly, they will appreciate the advice and support from the homeowner. If you really want to upset HomeAway, then cancel one of its bookings! They’ve spent a fortune attracting your guests and won’t reward listings that cancel guest reservations. Ensure your HomeAway calendar is updated to reflect your home’s true availability. The system will recognize every change that you make and reward you for it. Avoid inaccurate calendars that might create double bookings and cancellations! Large, professionally taken images are key to high search positions in HomeAway. No matter how much you love a picture you’ve taken at dusk, it probably isn’t as appealing as you might think to renters. Make sure you have the very best images available and ensure that all of the rooms are included, in a sensible order, with all of the home’s key features highlighted. Homes change and HomeAway knows it! If a home’s images are three years old, HomeAway will know that your listing isn’t as up to date as it should be. Get a few reshoots of the latest bedding and be mindful that the landscaping might well have grown a lot! Get those updated images online! HomeAway uses a smart ‘algorithm’ that figures out which homes to promote the hardest and you need to be one step ahead! Homes change a little over time. New Games in the media room? Mention it. New restaurants opened nearby? Mention it. Mention any relevant feature in and around your home as quickly as you can in order to prevent your content from looking stale. Writing is not as easy as people think, but keep things simple. Lists work well. Ensure that you use spacing to break up information and always remember the main reason guests are booking your home; to have fun! Write your descriptions in a fun way, with a focus on enjoyment and lifestyle! Always ensure that every special feature is listed in the home’s description. Adjust your descriptions to appeal to the ‘current market’. If there’s a cold snap up North, appeal to the guests’ with references to escaping the cold. Consider offering School Teacher, First Responder, and Military Discounts or welcome packs, in big bold capital letters to create a connection. You don’t have to give too much away to create that emotional connection. Sure, most listings say close to Disney, but perhaps take it one step further by mentioning how close the home is to newer points of interest etc. Guests might not know that Avatar is a brand new land within the Animal Kingdom, just 12 minutes away from your home! Pick a catchy name for your home. Make sure it isn’t already chosen too often and add it to the home’s title. Why? Your guest will see hundreds of homes, and remembering the name will help them find it again using google. Don’t fall into lowering nightly rates to crazy levels, but ensure that the home is priced correctly, and have a strategy in place to increase rates as bookings increase. If you’ve done everything right, with great pics, fabulous descriptions and lovely decor and furnishing, you might then be wise to experiment with subtle adjustments to the rates until it books. Do lots of homework on similar properties in and around the community to see what is going on. Warning: Some homes might show a high nightly rate, with lots of bookings, but the owner might be selling nights at heavily discounted rates, so consider your rate changes carefully. You don’t have to give too much away to create an interesting proposition to a buyer. A refrigerator full of groceries might only cost $75 but the thought will be appreciated by guests after a long journey to Florida. Low cost incentives can make a huge difference to bookings! Constant Updates to the home! If your home is tired, or out of date, it might show in the pictures, especially in comparison to other, newer homes on the market. Keep the home up to date and especially with a view to getting great reviews. Broken features, stains and worn furnishings really make guests see the worst in a home. Then they look for more faults! Make sure that your home only appears on HomeAway once! Duplicate listings of the same home can scare guests away. If your property manager is booking your home well, consider removing your listing, or in some cases, vice versa. Twice the exposure is not as good a thing as owners sometimes think! Dedicate time, all day and every day! Your vacation home is really a business and if you are managing your own listing on HomeAway, you need to be prepared to dedicate a bunch of time to keeping track of the home’s performance, competitiveness and of course answering guest questions. Try to answer all questions within 4 hours to keep enquirers engaged and comfortable. If you follow most of the tips above, especially lots of bookings, reviews and fast response times, you should at some point attain the Premier Partner badge. This gives guests added confidence in the home, but also boosts your place in search results! We hope that this really helps increase your rental home’s occupancy and creating lots of happy memories here at Reunion Resort, Orlando!